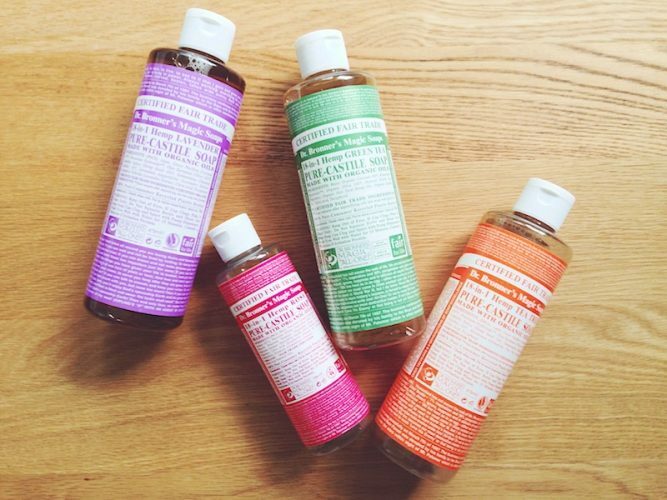 Home > New on the market > Skincare > My eco-favourite of last months: Pure-Castile Soap Dr Bronner’s. Finding a decent bar of soap, especially for people who want to lead eco-friendly lifestyle, is not that easy. I’m positive about this because I was searching and testing plenty of organic soaps. All the tests resulted in a failure, because either it turned out that the soaps were not as eco-friendly as a producer described them to be or they didn’t work at all. Quite a breakthrough happened when I discovered Magic Soaps by Dr. Bronner’s. Today, I would like to tell you a few words about these products. Dr. Bronner’s is a brand having a deep-rooted tradition of making soaps. Magic Soaps are classic cosmetics which have been produced for many years under the label of Dr. Bronner’s. We can be sure that the formula is completely organic because Magic Soaps are honoured by USDA Organic certificate. This means that the cosmetics are produced in an eco-friendly way, their formula is based on natural oils that are extracted from organic farming, as the bottles are recyclable. Is there anything more to ask for? I fell in love with Magic Soaps by Dr. Bronner’s since I’ve came across their review on one of foreign blogs. My great admiration with the products by Dr. Bronner’s was even deeper when I bought first package and started testing the cosmetic on my own skin. I couldn’t resist the urge to buy another bottles of the soap because Dr. Bronner’s Magic Soap is a washing cosmetic of numerous applications! What are the applications of Dr. Bronner’s Magic Soap? I’ve to admit that some applications of Magic Soap surprised me and I didn’t manage to give a go to all of them. However, I sincerely believe that this organic soap can be used in many different ways, always obtaining the same positive result. For me, the soap works best as a cosmetic for face washing and for bathing, because it smells in a pleasant way, removes sebum perfectly, and what is most important, it foams well contrary to other organic cosmetics. Since I’ve been using Pure-Castile Liquid Soap by Dr. Bronner’s, my skin is far from being dry or not-nourished. Furthermore, I was also testing liquid Magic Soap as a disinfecting product for make-up brushes. Personally, I mark working of this cosmetic as excellent – it removes even highly pigmented cosmetics and makes all the brushes soft. Dr. Bronner’s Soap is also good at cleansing hair and scalp. However, I don’t apply the product on my hair because I use other organic shampoo. I can’t say anything more about other features of Magic Soap simply because I haven’t tested them yet (I don’t need to).